This article won a prize from the Journal of Irreproducible Results. Once relegated to county fairs and half-time shows, competitive eating is becoming a mainstream phenomenon. Web sites devoted to the avocation list more than 80 major contests held in 2005 in specialties ranging from tater tots to tiramisu . The more popular events are televised and can include prize money in excess of $20,000 . There are even professional eaters with fan clubs . However, it can be a challenge to compare performances across eating disciplines since different contests often have very different rules. For example, at the top hot-dog eating event , competitors swallow as many wieners as they can over a period of 12 minutes. At the championship for birthday cake , on the other hand, contestants race to consume five pounds of cake in the least amount of time. For accurate comparison, results from these events must be normalized. 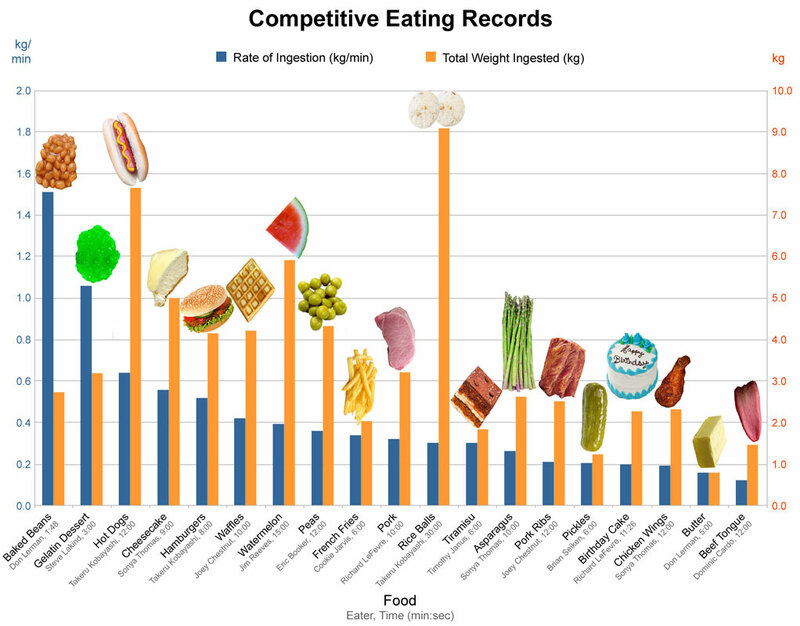 I analyzed 23 records taken from the International Federation of Competitive Eating (IFOCE) Web site . To normalize the records, I calculated the rate of ingestion (ROI) for each based on the total weight of food consumed and the length of time involved. The ROI for the records varied from a high of 1.51 kg/minute for baked beans to a low of 0.12 kg/minute for beef tongue (mean=0.43 kg/minute, SD=0.32). The results are presented as a bar graph. ROI varies directly with ease of consumption. The two foods with the highest ROIs, baked beans and gelatin dessert, are soft in texture and can be ingested with minimal mastication. The two foods with the lowest ROIs offer more formidable challenges to the eater. Beef tongue requires substantial chewing whereas butter can be extremely unpleasant to ingest in large quantities . “Debris” foods yield lower ROIs. Pork ribs and chicken wings are known as debris foods because they require eaters to cast off refuse during consumption. These foods both fall in the lower half of the bar graph, suggesting that separating meat from bone slows eaters down. Pork on the rib also has a 35% lower ROI than rib-free pork, another indication that debris foods handicap the eater. The Kobayashi effect must be considered. The two high outliers in terms of total weight were rice balls and hot dogs. The records for these foods are held by Takeru Kobayashi , who is currently the top-ranked competitive eater in the world  and legendary for his superhuman feats of ingestion. There is a good chance these high marks are due to Kobayashi’s exceptional capacity, not to the characteristics of the foods themselves. This is not the first study to seriously analyze the sport of competitive eating. In a 1998 paper titled “Can Abdominal Fat Act as a Restrictive Agent on Stomach Expansion?”  Krachie hypothesizes that larger competitive eaters can be at a disadvantage due to midsection fat. ROI analysis could extend Krachie’s work by examining whether eating performance varies consistently with certain physical characteristics (gender, body weight, ethnicity, etc.) of competitive eaters. The author thanks Professor Marti Hearst and Morgan Ames at the UC Berkeley School of Information for their advice during the preparation of this paper.